Do you know, If someone wants to buy a Motor Cycle, or a costly mobile or if your father wants to purchase a new flat, they generally take loan from a bank or from a financier. They need to pay monthly installments. Today, across the world, all the EMI's (Equated monthly Installments) are being calculated on compound interest. So after reading this article, you must be in a position to calculate the EMI you are going to pay for your new scooter purchase!! Before that, let us try to understand the meaning of compounding and discounting. We know that daily prices of the goods increase at a rate. Assume, A product which costs Rs.100 costs Rs.110 next year and Rs.121 that next year. Suppose, You lend Rs.100 to your friend and he promised to give you Rs.100 after 1 year. Do you accept it? Out of friendship we accept. But think like a financier. If you receive Rs.100 after 1 year the value of this 100 rupee may not buy the same amount of goods it would have purchased today as the prices went up to Rs.100. So we need to charge some interest. So how much is the interest? We use the formula of compound interest. That means, if the interest rate is 10%, Rs.100 today is equal to Rs.110 earned after 1 year and Rs.121 after 2 years. If a buyer sells a product to you at full payment get some interest on your amount for n periods. This total amount should equal to sum of all EMI's and the interests accrued on each EMI for the remaining period. Then only the seller did not get any loss. Assume we have taken a loan at period 0 and have to pay installments at the end of 1, 2, 3, 4th periods of x each. Now loan amount plus the interest on the total loan amount P at R% rate for 4 periods is equal to all the EMI's and interests earned for the remaining period. That is the EMI in the period 2 earns 2 periods interest and EMI in the 3rd period earns only 1 period interest. We should also solve this problem by Present Value (PV method). You learn this concept in any finance text book!! So Rs.110 discounted at 10% gives you Rs.100. Don't worry how to do this. This is quite simple. You have to calculate P from the compound interest formula. Here A = Rs.110, R = 10%, n = 1. 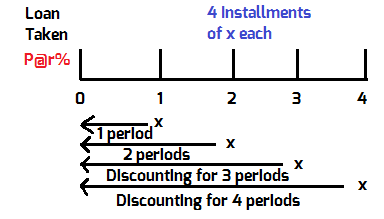 From the above diagram, if we have taken loan for 4 periods, the last installment should discount for 4 periods and so on. 1. A person borrowed a sum of Rs 6000 at 10% p.a., interest compounded annually. If the money is to be repaid in three equal annual installment, each payable at the end of the year, then what is the value of each installment? Let x be the amount paid at the end of each of the 3 years. 2. Three equal installment, each of Rs 200, were paid at the end of year on a sum borrowed at 20% compound interest compounded annually. Find the sum. Installments each of Rs 200 for 3 years. we use discounting method. We discount the installments for the present value. 3. A man borrows a certain sum of money and pays it back in 2 years in two equal installments. If C.I. is reckoned at 5% per annum and he pays back annually Rs. 441, what sum did he borrow? Total money borrowed = Rs. 820. 4. A man borrows Rs. 2100 and undertakes to pay back with compound interest @ 10% p.a. in 2 equal yearly installments at the end of first and second year. What is the amount of each installment? Let the installment be \(x\). The sum of the above values should equal to principal. The value of the principal after 2 years = The value of 1st installment after 1 year + the value of 2nd installment. 5. A man borrows Rs. 820 and undertakes to pay back with compound interest @ 5% p.a. in 2 equal yearly installments at the end of first and second year. What is the amount of each installment? 6. A man borrows Rs. 1820 and undertakes to pay back with compound interest @ 20% p.a. in 3 equal yearly installments at the end of first, second and third years. What is the amount of each installment? Suppose you have taken a loan of Rs.100000 to buy a house at 12% rate to be paid EMI's for 60 months. Following Schedule Is For : 100000 to repay in 60 months. 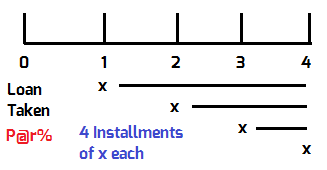 All calculations are based on EMI in Arrears(i.e. Rear Ended EMI's). Monthly interest is 1% per month. Now after 1 month, interest accrued is 1000. Of the total EMI of Rs.2224, Rs.1000 used for interest and the remaining Rs.1224 for principal reduction. Now Balance of Rs.98776 becomes the principal for next month. So interest is 987.7 or Rs.988.